Want more updates? Sign up Here! Each summer, RF|Binder has the pleasure of helping to raise awareness for a truly unique Boston organization, World Ocean School. Aboard Roseway, a 92-year old Tall Ship and National Historic Landmark, World Ocean School delivers experiential education at sea, creating excitement about learning for students of diverse backgrounds and supporting their academic achievement. Kids of all ages, over 60% of whom are low-income, spend anywhere from a few hours to a few days at sea for programs focusing on leadership, community service, and academic advancement. Students study navigation, literature of the sea, physics, local ecology and maritime history. Roseway itself has an incredible history, from its early days serving New England in World War II and the Boston Pilots Association to last October becoming the first authentic, original U.S. Tall Ship to dock in Havana in 57 years. This season, RF|Binder has helped support several particularly exciting initiatives for World Ocean School and Roseway. First, this year Roseway docked in Gloucester, MA for the next phase of a ​restoration that first ​started in 2002, necessary to preempt critical wear to the ship. Our team was able to secure stories in local outlets including Gloucester Times and Northshore Magazine, highlighting the efforts to maintain Roseway as a leading player in the tall ship industry as well as an effective and safe educational platform. The stories helped drive attendance to an open house to welcome the community to see the ship and hear tales of its amazing history. For the second year in a row, World Ocean School launched “Walk the Plank,” a fundraising initiative unlike anything on land or sea, giving people a chance to make a friend, family member or colleague literally walk the plank off Roseway into Boston Harbor. Those with the most online donations met a watery public ​fate at a special public event. The program helped raise thousands of dollars for World Ocean School. RF|Binder arranged local print and broadcast coverage, and our own Josh Gitelson, who serves on World Ocean School’s Board of Directors, was one of the nine people who took the plunge as part of Walk the Plank. Finally, Roseway had the honor of helping to lead the Grand Parade of Sail during Sail Boston 2017, as the city welcomed a fleet of more than 50 Tall Ships from around the world as part of the Rondez-Vous 2017 Tall Ship Regatta. 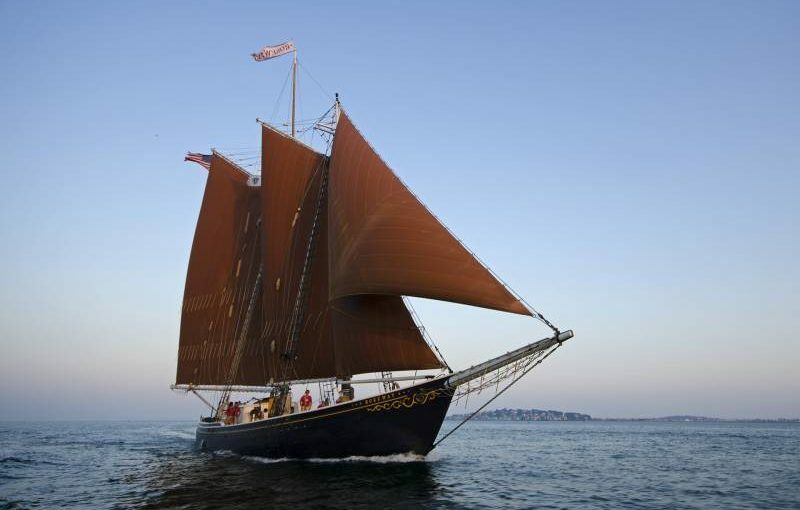 During this special event, RF|Binder helped shine the national spotlight on Roseway, working with Sail Boston organizers to feature the schooner on Good Morning America. For this fun story, Roseway captain Tom Ryan personally welcomed GMA meteorologist Rob Marciano aboard for some lessons on sailing a Tall Ship, showing him how to raise the sail, take the wheel, and even swab the deck. We look forward to continuing to raise visibility for this special organization. To learn more about the mission of World Ocean School and the history of the majestic Roseway, be sure to check out worldoceanschool.org.